You are here: Home / Food / Mum’s easiest vegan biscuits ever! Mum’s easiest vegan biscuits ever! I love an easy-peasy recipe that is safe for J and I love it even more when it is a recipe my family has been using since we were little! My mum has always made these delicious vegan biscuits and calls them ‘melting moments’. As they only have 5 ingredients they are perfect for making with children and they love rolling them in the oats or coconut. One of the great things about vegan baking is that you don’t have to worry about any raw egg so all kids can lick the bowl as much as they want! 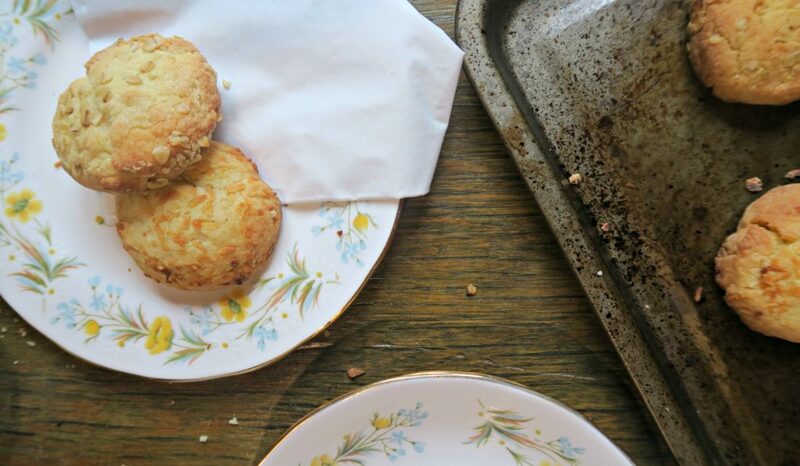 This vegan biscuit recipe is great to whip up in record time if you need something for a last minute play date or just a sweet treat for your afternoon cup of tea. As it only relies on store cupboard ingredients you are likely to have everything you need to hand. You can always leave out the vanilla essence if you don’t have it or make them without the coating – although I recommend both! Mum has been the original source of inspiration from some of my favourite recipes, especially my vegan chocolate cake which is always a winner and J asks for constantly! It’s amazing how many recipes are naturally vegan though or can be easily adapted and noone would ever know. These will soon become a staple in your house too I’m sure. Cream together the sugar and spread until pale and fluffy. Stir in the vanilla essence and fold in the flour. Wet your hands and form mixture into balls. Roll in coconut or oats and press down onto a baking tray. My Granny used to make these for/with us, but she used to roll hers in Corn Flakes. Happy memories. I’ll have to give cornflakes a go. I love the fact your granny used to make them too! The old school recipes are often the best. I have recollections of something similar in my childhood too! 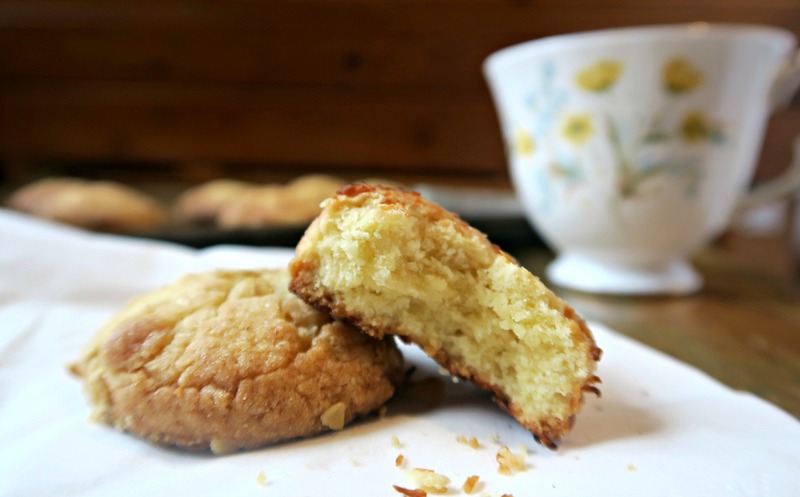 My son loves coconut, so might give these a go, with GF flour of course! Yes, it sounds like a few people remember these from being kids! I love a recipe that brings back good memories as well. Let me know how they go with GF flour. I usually make some of each as I like coconut but my husband doesn’t. J doesn’t seem to care which one he has! Thanks. Yes, I love an easy recipe too! I loved melting moments when I was a kid. My mum used to make them too!!! Happy days! I love that so many people had these as kids. That’s why it’s so important we bake with out kids too- making those memories. These look so good and I’m definitely going to give these a go! We now need to avoid coconut too (we seem to be collecting intolerances rather than getting rid of them! ), so we’ll use oats – thank you! Boo, it’s horrible when you add more things to the list. They are just as good with oats though! Yumm these look like the pefect biscuits to try and bake with the Little Man too as there is no raw egg to worry about! Thanks for linking this up at #sharethejoy – will be saving this recipe for later! Hope you and the little man enjoy them. They are great for making with kids as they’re so easy and everyone can lick the bowl clean! Yeah they are definitely are good one to make with the kiddos. These sound and look fab, shall pass onto my daughter who is a vegan in waiting! Thks gonna try this with orange juice and zest now.